A hotel guest wades to his car on Collins Avenue, Miami Beach's main thoroughfare, last fall. Frequent and increasingly severe flooding in the Miami area has prompted some Florida Republicans to want to act on climate change. Photo by Lynne Sladky, courtesy of AP Images. First in an occasional series on congressional coastal politics. A look at the issues and personalities shaping politics and policymaking in coastal congressional districts. But first, there was a chance encounter at a sushi line. Citizen climate activist Jay Butera was waiting for his sushi at the cafeteria in the basement of the Rayburn House Office Building almost three years ago when Rep. Ted Deutch joined him. "I'm waiting for my sushi to be made, and he [Deutch] walks up and says to the chef, 'What's good today?' The chef said avocado maki. So the congressman said, 'I'll have that.' And that's what I had ordered," Butera recalled. "So we started talking about that, and I hadn't even seen his lapel, so I didn't see his pin, so I didn't know he was a congressman." Butera, who spends much of his time commuting via train from his home in Pennsylvania to the nation's capital to talk with lawmakers about the risks of a warming world, told Deutch he worked on climate change issues. Deutch, a Democrat from south Florida, was also interested in the topic. "I told him I had spent a lot of time trying to figure out how to approach climate change, how to take a bipartisan approach to climate change," Deutch said. Rep. Ted Deutch (D-Fla.). Photo by Congress, courtesy of Twitter. Butera, too, had spent a lot of time thinking about how to get both Republicans and Democrats on board with climate change action. And that encounter started him thinking a lot more about Florida. Deutch "struck me as a very reasonable person who understood the same concept -- that this needs to be de-polarized and talked about," Butera said. "So, I began. I told him my idea for the caucus because it occurred to me then that a., the caucus would be a good idea, and b., Florida might be the place where it starts." By most accounts, Butera became key to the Climate Solutions Caucus' eventual formation, which Deutch and Republican Florida Rep. Carlos Curbelo announced in February. When asked about the caucus, multiple people directed E&E Daily back to the Pennsylvanian, who is senior congressional liaison for Citizens' Climate Lobby, a group that relies on citizen volunteers to push for climate action. CCL is also a big proponent of a revenue-neutral carbon tax to solve climate change. Butera frequently attends meetings and conferences in D.C. and Florida, and travels wherever else he's needed. Want to get a letter to a member of Congress about climate change? Butera will personally deliver it on his own dime on his next train trip into D.C.
John Van Leer, a sea-level rise expert at the University of Miami who's involved with CCL in south Florida, is among those who credit Butera for his grunt work to make the caucus happen. "A lot of it is just plain persistence," Van Leer said of how Butera and CCL operate. "But it's also trying to be strategic." But Butera doesn't like to take too much credit. "The members of Congress who are doing this deserve a lot of credit for what they're doing, and I don't want to take away from that," Butera said. "But on the other hand, someone needs to know people are working pretty hard to do this." In a recent interview at Rayburn's cafeteria -- his D.C. office, of sorts -- Butera showed up promptly in a gray suit and a purple shirt. He has close-cropped white hair and was eager to talk about climate change and the caucus. Butera said he first became interested in environmental issues when he connected the air pollution blowing out of smokestacks near his home in Pennsylvania to his childhood asthma. His varied career has included working on ships that helped contain a 1979 oil spill in the Gulf of Mexico and founding Cedar Fresh Home Products, a company that creates a variety of household and consumer goods. His official biography also lists his passion for sailing; he once sailed from the United States to Bermuda using only celestial navigation. Before meeting Deutch in the sushi line, Butera had already been pondering whether Florida might hold the key to future bipartisanship in Congress on climate. "It was my thought that if there was a Republican in Congress who would take this step forward and start talking about climate solutions, it would start in Florida," he said. "It was my theory that, and this has been in my mind since then, that salt water in the streets will trump party politics." The state, including areas represented by Republicans in Congress, is particularly at risk to sea-level rise linked to climate change. "The thing that makes south Florida so important is that it's simultaneously a place where you have a concentration of congressional Republicans," Van Leer said, "and it's also a place where the effects of sea-level rise are obvious to anybody who's not asleep." A recent study in the journal Proceedings of the National Academy of Sciences warned that up to 13.1 million people may face flooding and other risks from sea-level rise by the year 2100. The southern Florida counties of Miami-Dade and Broward represented a full quarter of all people affected. "Florida's coast is low-lying, so that of course contributes to risk. There are a lot of people who are living in these areas already in Florida, and then we're also experiencing extremely rapid growth within the coastal areas of Florida," said Jason Evans, a professor at Stetson University in DeLand, Fla., and an author of the study. "Those three factors combine together to make Florida the most vulnerable state." In some places, such as the Miami area, big tide events known as king tides are already bringing salt water up through drainage infrastructure that was built decades ago. 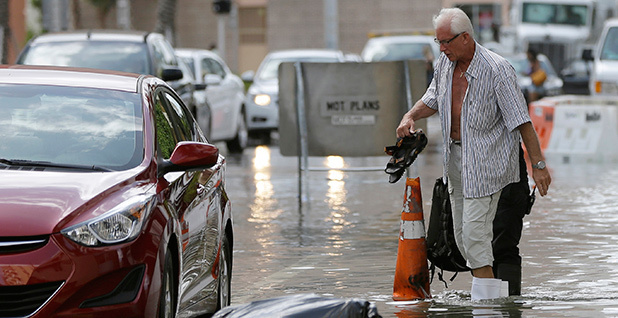 "There was flooding on my street in Miami on the king tides all fall, and even into the first king tide in January," Van Leer said. "And so that means the street will be flooded with salt water from the ocean, basically, that's come up through the drains and the streets. They work both ways -- they drain it out, and they let it in. It's a very big nuisance." As a result of the effects, people in Florida tend to be on the higher end of polls for expressing concern with global warming, according to Jon Krosnick, a political science professor at Stanford University who's conducted polling across the nation on climate change views. Counties and cities in the southern part of the state are struggling to get a handle on what higher sea levels will mean. Miami Beach is spending millions to elevate roads that are facing the biggest impacts. Just south of Miami, the city of Coral Gables has completed maps of its vulnerabilities and found that about 300 boats -- many very expensive -- are likely to be trapped inshore if sea levels rise a few more inches because there won't be enough clearance under bridges to let them out. Southern Florida is "ground zero" for climate change, Coral Gables Mayor Jim Cason (R) said in a recent interview. This is despite the fact that, in a widely publicized action, Republican Gov. Rick Scott reportedly banned state officials from saying the phrase "climate change." But businesses are helping drive politics in counties and cities because the impacts could be numerous and affect both big developers and small stores along the shore. "If you're a small mom and pop, let's say a deli or cafe, you rely a lot on tourism traffic," said Irela Bague, chairwoman of sustainability of the environment and energy committee at the Greater Miami Chamber of Commerce. "If the streets are flooded, nobody's coming in." Sitting on the couch in front of the window in his green-painted office back in Rayburn, Deutch, who represents an area that's slightly north of Miami, said in an interview that he has "very strong opinions" about climate change due to what's happening in his state. "I'm right where the overwhelming majority of the scientific community is on this issue," he said. "The fact is, we know that there's sea-level rise. We know in Florida we've got saltwater intrusion issues. We know that there are property issues along the coast. We know that the severity of storms has increased. So we ought to be getting together to figure out ways to deal with these issues." But though the state seemed an obvious place to start looking for members of a bipartisan climate caucus, there were no immediate takers among Republicans in Florida's congressional delegation. "At first I was bouncing around this idea alone," Butera said. "I was going to the Florida delegation on Capitol Hill and trying to see would there be support for this concept. And it was a lukewarm reception. 'Yeah, maybe if it got going, we'll look at it.' That sort of type of response. No one wanted to go first." There were, to be sure, many Democrats who were interested. But the Congressional Safe Climate Caucus was emerging at the time and promised to be filled with Democrats; the idea was to be something different. "It's the Noah's Ark approach," Deutch said. In other words, to join as a Democrat, you had to bring a Republican with you. In late 2012, shortly before the push for the caucus began, interfaith groups began coalescing around the idea that a moral message would prompt Congress to take action on climate change. Led by the Friends Committee on National Legislation, an informal coalition of organizations began meeting with legislators, predominantly moderate Republicans, to see if they could, by pushing a moral message, get support for a congressional resolution on climate change. "We wanted to elevate that dimension of advocacy on climate, which I would say has been relatively understated prior to that," said Jose Aguto, legislative secretary of sustainable energy and environment at FCNL. "I think it's always been implied, but it's never had the kind of moral cachet that something like the civil rights movement or other social movements in the past have more forthrightly expressed." As with the caucus, it was rough going at first. "We learned sort of the hard way that when you start bringing in some of the live issues, it immediately devolves or gets distracted away from the fact that we're all in this together, and we're all impacted," Aguto recalled. Butera and Citizens' Climate Lobby learned of the efforts and decided it would be an easier lift to first introduce the resolution -- which did not commit Republicans to any specific actions -- than to create the caucus. And so CCL threw its weight into helping build up support for the resolution. Rep. Chris Gibson (R-N.Y.). Photo courtesy of the Gibson campaign via Facebook. In September 2014, according to Aguto, Rep. Chris Gibson (R-N.Y.) agreed to introduce the resolution, which would later become known in climate change advocacy circles simply as the "Gibson resolution." It stated that climate change had the potential to "adversely impact all Americans" and that the House should work to find solutions to address the causes of global warming. Once Gibson was on board, the coalition needed co-sponsors. And so Curbelo entered the picture. Butera said he visited Curbelo's office on the new congressman's swearing-in day in January 2015 to broach the topic of climate change with the moderate Republican. He and others continued to press him to co-sponsor the resolution after Gibson came on board. "And then one day he said, 'OK, I'll do it,'" Butera said. "We shook hands. I said, 'You'll be an original co-sponsor.' He said, 'Yes, I will do it.' And for me, that was a big day." Along with finding the first co-sponsor for the Gibson resolution, CCL had also found in Curbelo the Republican ally it needed to form the Climate Solutions Caucus. The son of Cuban exiles, Curbelo was born in Miami and has lived in the Kendall area south of the city since 1995. He is one of the House's youngest members, elected to represent the area south of Miami and the Florida Keys in 2014 at the age of 34. Curbelo's spokesperson said that the congressman was too busy for an interview for this story, but a review of his public statements shows he started taking an active interest in the issue of climate change just a few months after assuming office. Rep. Carlos Curbelo (R-Fla.). Photo courtesy of the Curbelo campaign via Facebook. After coming out in support of climate change action, he rode on Air Force One with President Obama on Earth Day 2015 to attend Obama's speech on climate change in the Everglades. In a much-publicized event the following month, 200 fifth-graders gave him thank-you cards for pledging to address global warming. "I realized some time ago that this issue is an existential threat to where I live. And I want to live here for the rest of my life," Curbelo said in a recent phone call with Citizens' Climate Lobby. "My wife and I have two little girls. I want them to have at least the choice to live here in south Florida for the rest of their lives." Curbelo's district is home to schools that are highly vulnerable to sea-level rise. On Stock Island, one of the Florida Keys, city planners added an extra foot and a half to a planned fire station to accommodate sea-level rise. "He has a great pulse of what's going on not only in south Florida but in his district in particular," said Karina Castillo, Latino outreach organizer at Moms Clean Air Force and a resident of Curbelo's district. Castillo wrote a letter last summer to Curbelo thanking him for taking a stand on climate change and offering her services as a local expert; she had been working for a climate education group at the time. Curbelo's staff responded with a request for a meeting. Castillo met with the staff in late summer to talk climate change. And when Curbelo's office began forming a climate change advisory committee for the congressman, staff members reached out again in December asking Castillo to join. Curbelo personally attended the group's second meeting, she said. "He wants to know more," Castillo said. "He's interested in the science. He doesn't just want to hear, 'OK, what are the solutions?' He wants to understand the problem, I think to better understand the solutions and what's really viable and what's not." Rep. Ileana Ros-Lehtinen (R-Fla.). Photo by Congress, courtesy of Wikipedia. Although getting Curbelo on board with the Gibson resolution was a big step for advocates, Gibson wouldn't introduce the resolution until it had at least 10 GOP co-sponsors, according to Butera. And so began an effort to convince other GOP members that supporting climate change action was a safe move politically. Curbelo, Butera said, began to do a lot of outreach to other members of Congress to join the Gibson resolution. On the recent call with CCL, Curbelo said he often used a specific line with his colleagues in the House when talking about climate change. "I tell them, and I've said this to some in the media, as well," he said, "but ignoring climate change is as reckless or as irresponsible as ignoring our country's growing national debt and the fiscal crisis that looms if we do not take action and make some meaningful reform to some of our mandatory spending programs. This is the same theme as when it comes to climate change. The debt with the climate is growing." Rep. Ryan Costello (R-Pa.). Photo courtesy of the Costello campaign via Twitter. Curbelo said he has often tried to use humor: "I've told several of my colleagues who blow me off, I've said, 'All right, when my district's underwater, I'm going to move to your state, and I'm going to run against you.'" Other groups joined in attempting to persuade Republicans to hop on board the effort. Former South Carolina Rep. Bob Inglis' Republican-focused clean energy group, RepublicEN, spoke with lawmakers and held meetings in south Florida. Business leaders and mayors from Florida got involved to stress the local impacts to lawmakers. CCL received help from former Miami Mayor Maurice Ferré (D), who advised them on which local leaders would have the most sway. Those groups played a large role in persuading Rep. Ileana Ros-Lehtinen (R), Florida's most senior House member, to join in the burgeoning GOP effort on climate. Almost a year ago, a group of mayors and local officials met with her in Miami. Rep. Mike Fitzpatrick (R-Pa.). Photo by Congress, courtesy of Wikipedia. "We basically said, 'It's clear here that the sea levels are rising,'" said Coral Gables Mayor Cason, who was at the meeting. "And from all the information that we see and believe, it's certainly going to go up much higher, regardless of what we do in the future. ... We said, 'We think it's important for someone who represents our area to try to get colleagues in the Congress to say this should not be a partisan issue.'" In June, at a fly-in organized by CCL in D.C., about a half-dozen members of the advocacy group met with Ros-Lehtinen in her capital office. There, Butera handed her the results of a survey he personally commissioned that found more than 80 percent of constituents in her district, Florida's 27th, believe that Congress should acknowledge that climate change is a problem and explore solutions. Gibson introduced the resolution in September 2015, a few days before Pope Francis addressed Congress on climate change, with 10 original co-sponsors, including Curbelo and Ros-Lehtinen. GOP Reps. Tom Reed of New York and David Jolly of Florida have since signed on, bringing the total number of co-sponsors to 12. And Deutch and Curbelo filed the paperwork for the Climate Solutions Caucus in February of this year. Rep. Patrick Murphy (D-Fla.). Photo by Congress, courtesy of Wikipedia. Since then, the caucus has grown to 10 members with the addition of Gibson and Ros-Lehtinen; Pennsylvania Republican Reps. Ryan Costello and Mike Fitzpatrick; and Democratic Reps. Alan Lowenthal of California, Patrick Murphy of Florida, Brendan Boyle of Pennsylvania and John Delaney of Maryland. The advocacy continues. Just last week, the Greater Miami Chamber of Commerce was on Capitol Hill meeting with members of south Florida's congressional delegation and continuing to press the issue of sea-level rise. Curbelo said that his initial goal is to get all of the Republicans who joined the Gibson resolution on board, which, if an equal number of Democrats join, would bring the caucus' ranks up to 26. "Once all of us have joined, then the goal becomes to recruit new people," he said. "As a lot of members get past their primaries, I think they're going to be even more open-minded and more willing to do the right thing with regard to this issue." Members of the caucus will hold their first meeting tomorrow morning. According to Butera, who will be at the meeting, they'll hear a presentation from representatives from Statoil ASA and New Zealand's minister for climate change issues. Statoil was among a group of oil and gas majors that last year came out in favor of carbon pricing. Rep. Brendan Boyle (D-Pa.). Photo by Congress, courtesy of Wikipedia. What the caucus can actually accomplish is still up in the air. One Republican energy strategist offered a cynical view, saying that Republicans were joining it simply to receive campaign donations from GOP climate activist Jay Faison, who recently pledged to spend millions this election cycle supporting clean-energy Republicans. Leaders of the caucus acknowledge that they don't have a clear path forward. "I don't have a policy proposal now. We don't have a legislative agenda," Deutch said. "I think our agenda at this point is really to focus on how the people who are on the front lines here are grappling with climate change, to hear about their experiences, and then to work to come up with some legislative ideas based on what we've heard." Curbelo believes that markets "usually lead us to the ideal places" as opposed to government regulations. While he voted last year against a congressional resolution that would have killed U.S. EPA carbon regulations over new power plants, he voted for a separate one that would have quashed the agency's Clean Power Plan to address existing power plant emissions. Rep. Alan Lowenthal (D-Calif.). Photo by Congress, courtesy of Wikipedia. Marc Boom, associate director of government affairs at the Natural Resources Defense Council, said he was optimistic that conservatives and environmental groups could one day find agreement on climate, but he noted that NRDC has been "very focused" on the Clean Power Plan. There would be "lot of reluctance," he said, for anything that gets rid of EPA authority to regulate greenhouse gas emissions. Butera said that everyone involved needs to be comfortable with moving toward the middle. "It's not at all just about getting Republicans to alter their course on the issue," Butera said. "In order for this to be successful, for us to find a legislative solution, both parties need to move to the center on a solution that works for the country." One issue clouding the caucus' future is that some key House Republicans who have announced their support for climate action, including Gibson, are leaving Congress after this year, and others -- including Curbelo -- are facing tough re-elections. But Peter Jacques, an associate professor of political science at the University of Central Florida, said that Curbelo's strong position on climate change may actually help in his purple district. Rep. John Delaney (D-Md.). Photo by Congress, courtesy of Wikipedia. "I think that when you see somebody moving away from the expectations for Republicans -- it might be expected that they reject climate science," Jacques said. "I would imagine if you're an independent or a Democrat, and you see somebody moving away from that toward a more reasonable understanding of science -- I would imagine that that's very appealing." No matter what happens in the upcoming elections, Butera is confident that the caucus has momentum. He said that the fact the caucus decided on retaining the word "climate" in its title shows the conversation in Congress on climate has permanently shifted. "There's been many meetings on what name to use. You know, 'Resiliency Caucus,' 'Coastal Issues Caucus,' 'Coastal Resilience Caucus.' I mean, I've got lists of anything but climate," Butera said. "And that fact that today we can call it the 'Climate Solutions Caucus' and have Republicans signing on demonstrates how much the conversation's changed." Caucus leaders are also optimistic that they've started the ball rolling on climate action in Congress. "This is it, this is our hope, this is the beginning, and I have no doubt that we will be successful," Curbelo said. "The question is, how long will it take?"